As we have since July 2006, each Friday we’ll post a mixed bag of quick cigar news and other items of interest. Below is our latest Friday Sampler. 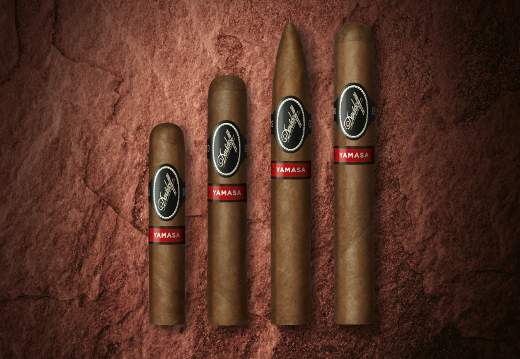 1) Davidoff’s newest cigar will be Yamasá, named for a 21-hectacre “harsh and unforgiving swampland” in the Dominican Republic from which Henke Kelner and his team have been trying to grow tobacco for two decades. “For the Yamasá region to unveil its true potential, Kelner and his team had to first nurture nature,” reads a press release. “They conditioned the soil by adding calcium carbonate, agricultural lime, and slaked lime/dolomitic lime. This they did at intervals of every two months, by hand, and to each and every single tobacco plant, then once a month, before transplanting.” Other painstaking measures were taken in the seed selection and curing processes. The resulting cigar features a so-called Yamasá wrapper (first featured in the now discontinued Davidoff Puro d’Oro), a San Vicente binder from Yamasá, and filler tobaccos from Nicaragua and the Dominican Republic. Four sizes will hit the market in late July: Petit Churchill (4 x 48, $12.90), Robusto (5 x 50, $19.70), Toro (6 x 52, $22.70), and Piramides (6.1 x 52, $23.00). 2) The Velvet Rat is back. The cigar that was previously released in 2012 in extremely limited quantities will soon be made available via the recently announced Drew Diplomat Event Series, a tour that will culminate on August 6 at the second annual Connecticut Barn Smoker, which takes place at the same Connecticut River Valley farm that produces the wrapper for Liga Privada No. 9 and T52. “In total, 5,000 Velvet Rats were produced in January 2015 and have since been at La Gran Fabrica Drew Estate aging in the company’s cold rooms,” reads a press release. The Lonsdale-sized cigar (6.25 x 46) sports a Connecticut broadleaf wrapper, Brazilian Mata Fina binder, and filler tobaccos from Honduras and Nicaragua. It is intended to be a lighter, creamier experience than the famed Liga Privada No. 9. In November 2012, StogieGuys.com awarded the Velvet Rat a rare five-stogie rating. 3) The growth of the Nicaraguan cigar industry has led to overall growth in the U.S. cigar market in recent years, but the deteriorating relationship between the U.S. and Nicaragua has recently become a point of concern, especially for the cigar industry. This week culminated in a State Department warning for travelers to Nicaragua. The alert cites increased scrutiny of U.S. visitors, upcoming Nicaraguan elections, and the proposed Nicaraguan canal as reasons for the heightened security risks. 4) Inside the Industry: Sin City has long been a hot-spot for cigars, including Casa Fuente. Now you can add the new Davidoff of Geneva Cigar Bar (across from the Wynn Casino) as another Las Vegas cigar landmark. The indoor-outdoor space features views of the Strip, a state-of-the-art ventilation system, and a fully-stocked walk-in humidor. 5) From the Archives: Fancy butane touches have their place (especially if you are outdoors and trying to light a cigar in the wind), but don’t overlook wooden matches. As noted in this 2007 article, instead of flash-frying your cigar there are times when a match or three will do the job far better, not to mention basically for free. 6) Deal of the Week: Alec Bradley fans will want to check out this deal from Smoke Inn. Any purchase of a box of Alec Bradley cigars will, for a limited time, include a five-pack of cigars and a travel ashtray. Plus, use the code “Stogie10” at checkout for an extra 10% off any box purchase. This morning Cigar Aficionado is reporting what has long been rumored: The Oliva Cigar Co. has been purchased. The buyer is J. Cortés Cigars N.V., a private business out of Belgium known for its machine-made cigars.